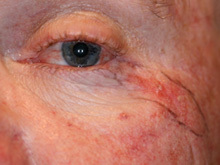 These are more aggressive than BCC’s and arise from areas of sun damage such as solar keratoses. They are characterized by their flat and crusting appearance. If caught early they are less likely to have spread. They may spread via the lymphatics to the nodes of the neck and they may spread along the nerves. Sometimes they arise from patches of Bowen’s disease, which are flat plaques of sun damage characterized by their crusty surface. 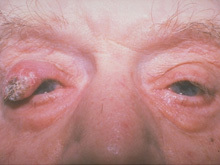 The lesion on the left is called Bowen’s disease, a localized form of SCC.